What separates resistance from opposition? Opposition implies a balance of power, a discussion, an exchange – it is an intellectual stance. Resistance is bodily in nature. One does not oppose a rushing wave, one resists its force. One cannot reason, cannot have a discussion with the cold; one can only resist its bite. In our current political situation, with Republicans controlling both the executive and legislative branches, there is no true “opposition” to the Trump government. Resistance may be the only option. So how does one resist a government? Randall Benton’s image of a protest at a Town Hall in Northern California details one response. The photo is stressful and kinetic. Reading left-to-right, as we’re inclined to do, our eyes fall first on the woman protester. Her hair, her sweatshirt, and her face are all red. The color, as a signifier of anger, passion or violence only amplifies her pose. As if any more emphasis was needed, she holds two signs, not one. The way her arms are arched in the air, she seems poised to strike. As agitated as she is, the sign screams for her. It is possible to read the pose as exasperated resignation (we “throw up our arms in frustration”) but the stronger likelihood is rage and threat. The second figure in the foreground, the object of the hostility, is Republican Congressman Tom McClintock. McClintock too is red-faced. He could be enraged also, but his reaction, in response to hers, seems just as likely some mixture of anger, fluster and alarm. Even as the congressman turns towards the woman, though, he buttons up his jacket – he is closing himself off. There is an assumed code of civility being broken by the woman, a code signified by the staid, conservative suit. The buttoning is not really civil at all, though. It’s armoring. The third figure in the foreground is a police officer, speaking into his radio with a concerned look. As the armed wing of the state, the police are there to protect the congressman from bodily harm. Their presence in this protective capacity heightens the sense of danger. If they are there to protect, they must be protecting McClintock from something. The woman in red is the danger – the implication being that the state needs protection from its people. There is an equally conspicuous reading of the policeman, however. It’s that McClintock must be protected because of something. 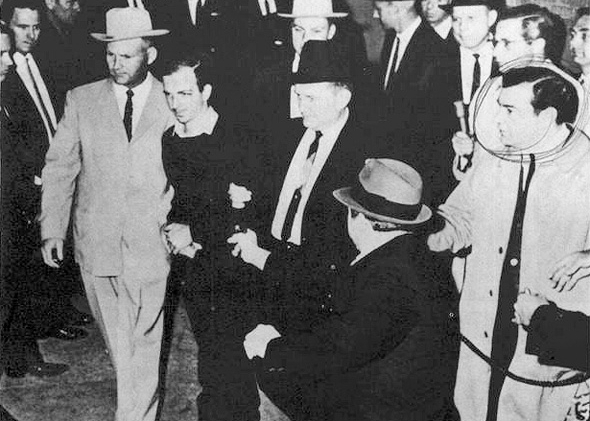 The photo also posits McClintock as a criminal being apprehended (this photo of Lee Harvey Oswald just before his murder comes to mind). McClintock’s offense is precisely his status as representative of the state. You’ll also notice the man holding a camera. His body mirrors the woman’s body, both arms in the air, the camera taking the place of the sign. But the camera proves a statement, as well. If a protest is to be truly effective it must resonate beyond its immediate action. The way to affect this resonance is to not just document the protest, to turn it into a spectacle. Documentation itself becomes an act of protest and resistance. In that regard, the light above the camera man serves as a spotlight here, shining on McClintock as if theatrical staging. But notice the camera also points towards us. McClintock and the woman in red are the spectacle, the protest, but only because the camera is viewing it, as are you and I. Resistance, as I said before, is a bodily state. This photo reminds us of the stakes of resistance – bodies, not just ideas, are on the line. But mere physical presence is not enough. What ultimately empowers the woman and this action is the participation of the viewer. It is the bearing of our own weight. Photo: Randall Benton/AP. Caption: Roseville police escorted Republican congressman Tom McClintock through an audience on 4 February.